This is Kelly. 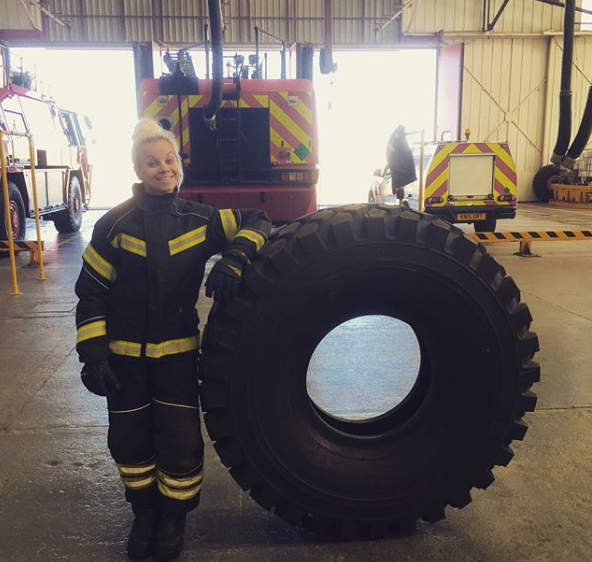 Kelly is a fulltime firefighter at Blackpool Airport and a retained firefighter at Colne and next week will be running up and down stairs, running with 80kg weights and hitting a weight across a platform using a sledgehammer. No, Kelly isn’t in training for the next Wonder Woman film (though we think she should) but is due to take part in the British Firefighter Challenge. The annual sporting event pushes firefighters to their absolute limit whilst not only raising funds for the Firefighter’s Charity but also provides a day of entertainment for spectators and shows crowds the sort of training and fitness levels that firefighters must maintain. Not content with juggling two jobs Kelly was looking for a tough challenge to test her mentally and physically. Having to have to carry out regular fitness drills for her role as a firefighter anyway the British Firefighter challenge seemed like the perfect challenge. With less than a month to go until the challenge Kelly was drafted to Winter Hill to help tackle the large moorland blaze. Working on the moors alongside her primary job will have no doubt impacted on her final weeks of training but Kelly is confident that she is ready and has the full support of all her firefighter colleagues, friends and family and Lancashire Fire and Rescue Service. Kelly will be competing against up to 20 other female firefighters from around the world at the Arc Shopping Centre in Bury St Edmonds on 27 July. To support Kelly and the Firefighter’s Charity, who this year are celebrating their 75th Anniversary, please go to Kelly’s JustGiving page.